To answer this question from listener Eliza Keller, 'Brave Little State' goes deep into the woods, and also deep into a hiker hostel in downtown Rutland. That’s what Eliza Keller, a Post Mills native now living in Boston, was wondering when she put her question to Brave Little State. Editor's note: As always, we recommend listening to the episode! Every month, VPR’s people-powered journalism podcast answers questions about Vermont that have been submitted and voted on by our audience. The prompt is simple: What question about Vermont, our region or its people do you want VPR to investigate? Of her winning question, Eliza says she doesn’t have any strong connections to the Long Trail, but she remembers learning about it in school. This is true. The Long Trail was created by the Green Mountain Club in the 1910s and ‘20s. It was actually the inspiration for the much longer Appalachian Trail, which runs all the way from Georgia to Maine. Eliza says the relatively shorter length of the Long Trail appeals to her. “To me the Appalachian Trail and the Pacific Crest Trail are just sort of too intimidating, but the Long Trail seems like a nice doable option to do with sort of limited hiking abilities,” she says. Depending on your pace, it can take you anywhere between two weeks and more than a month to hike the trail. You do need the luxury of free time to do the trail in one go; this is called a thru-hike. Though when it comes to the Long Trail, “luxury” is intertwined with hardship. “I’ve certainly been interested in making the hike, but I wouldn’t even know where to start preparing or what to expect,” Eliza says. To answer Eliza’s questions, Brave Little State goes deep into the woods, and also deep into a hiker hostel in downtown Rutland. It’s August. Alec Fleischer is in the woods outside Bennington. And he’s a little lost. Alec is by himself, taking video on his phone. This morning he started off in Williamstown, Massachusetts, right on the Vermont border, heading north to Canada. It’s his first day on the Long Trail, and he’s planning to walk the trail for the next three weeks. That is, if he can get back on it. “So yeah. Day one,” he says with a hint of frustration. He pans to a lightweight hammock strung up between two hemlocks, next to a river. All is well. 15 miles down, 257 to go. Since we here at Brave Little State sadly could not thru-hike the Long Trail to answer Eliza’s question, we were thrilled to meet Alec Fleischer, because he documented his own journey super well. In every video he takes, Alec is wearing the same blue Under Armour T-shirt. He films himself, then he turns his camera toward the trail, and we can see him moving slowly through what thru-hikers call “the green tunnel.” Just a narrow trail surrounded by dense woods. The occasional tree has a white blaze painted on its bark — that’s how Alec knows he’s on the Long Trail. And he pretty much just walks. And walks. Alec Fleischer, 21, is native of New York City and a student at Middlebury College. Alec, who took the trail name Hemlock, decided to thru-hike the Long Trail between his summer job and the start of classes. Alec is 21. He grew up in New York City, and he goes to Middlebury College. He just finished a summer job at the Vermont Agency of Natural Resources, and he’s doing this hike before classes start. He’s an environmental studies major with a focus in policy, and he is clearly loving his one-on-one time with nature. More often than not, though, Alec’s captain’s log is about more basic stuff. Things like the weather, and how his body feels. And then there are these moments of seeming bliss, usually at the end of the day, or on top of a mountain. Long Trail hikers are rewarded with a string of views, like this one from the north peak of Mt. Ethan Allen, as they traverse the ridgelines of the Green Mountains. “I just took a nap here, and really really don’t want to leave. It’s f---ing gorgeous,” Alec says, in one video. His legs are splayed out on the rocks near Mount Grant, and he has a clear, panoramic view of the mountains. We should explain how we met Alec. 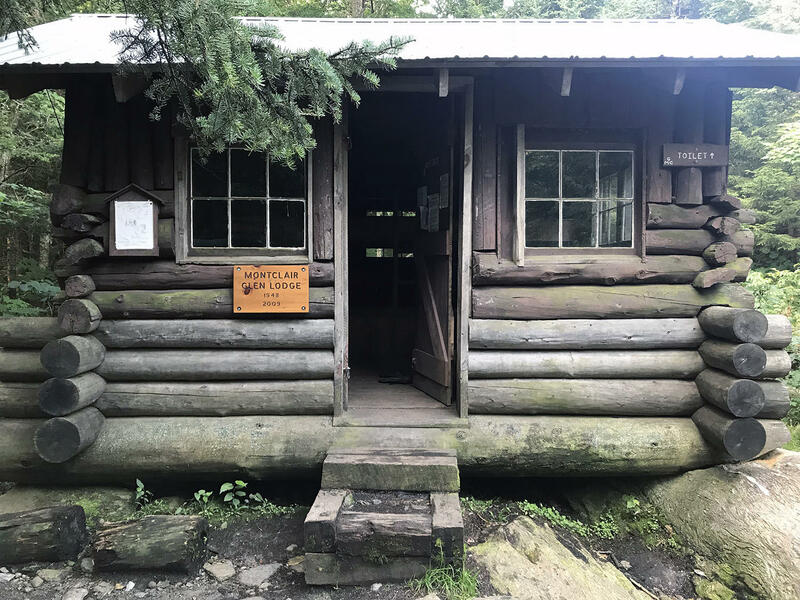 In late August, Brave Little State hiked into a Green Mountain Club shelter called Montclair Glen Lodge. It’s on the shoulder of Camel’s Hump. It’s late afternoon, and there are two thru-hikers settling in for the night. The Green Mountain Club's Montclair Glen Lodge, on the shoulder of Camel's Hump, offers hikers a dry place to sleep. This is where we learn some of the lingo of the Long Trail, or LT, as thru-hikers call it. For example, many hikers have trail names, kind of alter egos for their hike. One hiker in the shelter goes by Detour; his regular name is Eric DePalo. Sometimes a trail name is bestowed upon you, but Detour chose his. Detour is 30, and he lives in Massachusetts. He hiked the Appalachian Trail seven years ago. 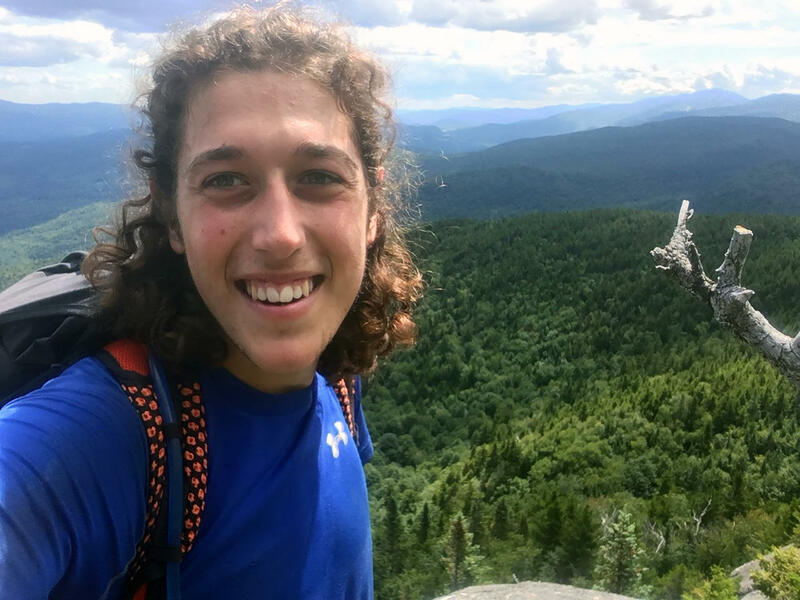 Now he’s hiking the Long Trail northbound, or, in trail parlance, “nobo.” Southbounders are “sobo.” That’s what Quinn Brencher, of Connecticut, is doing. He doesn’t have a trail name yet. Since they’re going in different directions, the two hikers compare notes on the trail. Quinn tells Detour that the next couple of days will be “pretty tough, not gonna lie,” and Detour warns Quinn that the southern part of the LT will be more crowded with hikers, since it overlaps with the Appalachian Trail about 100 miles, from Rutland south. While they chat they each go through their evening routines. First order of business? Feet. “First thing I want to do is take off my shoes, because my feet have been wet pretty much every day,” Quinn says. Quinn takes off his socks and repeatedly smacks them on the floor. And Detour gives himself a kind of backcountry pedicure. It’s around this time that Alec walks in the door — and recognizes Quinn. It turns out the two hikers go to Middlebury College together, and they know one another. Not super well — Quinn calls him Alex at first. But it’s the trail, so everyone warms up quickly. “I’m probably talking so much just ‘cause I’ve been alone for like days on end,” Alec confesses as they trade stories from the trail. Soon it’s dinnertime. Everyone fans out on the rocks outside the shelter with cookstoves and variations on beans or pasta. As sunset light sneaks through the trees, we learn some more Long Trail slang. “Mike and Mary! Yeah we both ran into Mike and Mary, and they [were] just parked out in a parking lot, and were grilling burgers. They had some fresh corn that they were grilling too, from their garden, some cucumbers,” Alec recalls. “It’s a miracle. So trail magic is when somebody’s stupidly nice for no good reason,” Detour adds. Eventually we ask these guys to answer Eliza’s questions directly. What is it like to hike the Long Trail, and what motivates people to hike it? Detour: “It’s really hard and it’s really uncomfortable, and you’re not going to like it. But I think backpacking is the art of being comfortable while being uncomfortable, or learning how to be comfortable through discomfort. Quinn: ‘I’m generally quite introverted, and I find myself enjoying human contact so much more out here, and I don’t know why. Maybe it’s because I spend most of the day alone. But I really, like, I’ve never been comforted by seeing just like an old couple before. ... Seeing these sort of human relationships, like, for some reason it's, I don't know, it's a lot more potent now." If you’re hiking alone, it’s mostly at shelters or lean-tos where you get to socialize. Or, if you’re in town for a resupply, there are certain hostels and inns that are well-known among hikers. Alec/Hemlock told us about one that’s kind of legendary. It’s called the Yellow Deli. The Yellow Deli isn’t associated with the Green Mountain Club, which stewards the Long Trail. But it seemed like such a fixture of the LT experience that we decided to check it out. Breakfast at the Yellow Deli starts promptly at 7:30 a.m., in a room with dark wood tables and creaky floors. There are maybe 30 hikers here today — most of them young, and many who’ve been hiking the Appalachian Trail. 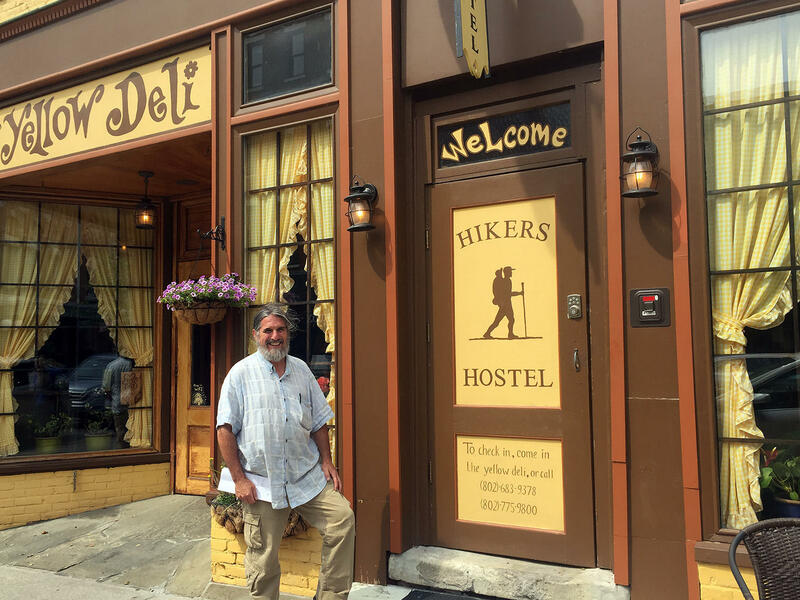 Though it isn't associated with the Green Mountain Club, the Yellow Deli restaurant and hikers' hostel, in downtown Rutland, is well-known among thru-hikers for its generous hospitality. A man named Aysh walks around with platters of eggs and fresh fruit and vegetables. “And who wants some more eggs at this table?” Aysh asks the room. A number of hikers motion to him. “Now that’s a true thru-hiker!” he exclaims. “Hikers have unlimited appetites. You can tell the difference between a Long Trail hiker and [Appalachian Trail hiker] by how much they eat. Because Long Trails have only been going for about a week. These people have been going for about three to five months,” he says as he points to a couple of hikers. Aysh has a beard and wears his grayish hair pulled back in a short ponytail. The Yellow Deli Hikers Hostel is on the second floor above the restaurant, up a long, steep stairwell. There are multiple bunk rooms and bathrooms and a half dozen washer/dryer machines. A hiker named Megan Mondor walks through a small common area with sofas and a small dish-washing station in the corner. Then she opens a glass door that goes out to a wide flat roof. Megan is 31, and she works in biotech in the Boston area. She says she hiked the entire Appalachian Trail two years ago by herself. Since then, she’s gotten into long-distance running and rock climbing. And now, she’s 10 days into thru-hiking the Long Trail. This time, though, she has a companion. “Here’s my little pup, Huck Finn,” Megan says as she gives her dog a pat. One of the pluses of the Yellow Deli hostel is that it does allow dogs – just not inside. So Megan and Huck are sleeping up here on the roof, in what she describes as “a little yurt” that the hostel has set up for hikers with animals. 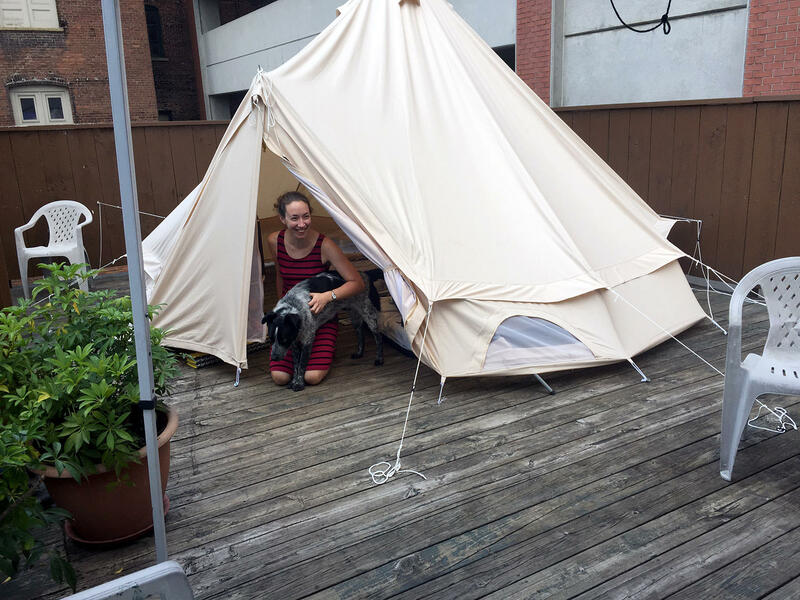 Megan Mondor, trail name Whoopie Cat, is thru-hiking the Long Trail with her dog Huck Finn. The Yellow Deli welcomes hikers with dogs to camp in a rooftop tent. Megan says it’s more work hiking with her dog, because she has to put his needs first. “I decided to come out here, he didn’t. And so we did some conditioning hikes in the White Mountains over the summer – see how he’d do on all the rock scrambles and stuff. But he’s pretty nimble. He’s like a little mountain goat – he does really well,” she says. Megan’s trail name is “Whoopie Cat.” And where does that come from? Sometimes “adventure” means dealing with plans that’ve gone awry. Megan’s plan was to get back out on the trail first thing this morning. She was going to take a shuttle which stops right behind the hostel. But it turns out the shuttle is actually a regular city bus – and for Megan, that’s a problem. “So, I can’t take the bus because I have a dog, and he’s just a regular dog and not a service animal. So I’ve got to find another way back to the trail,” she says, sounding a bit dejected. But she quickly gets the name of a local trail angel who she thinks can help out. “I think his name is Plans Too Much. He’s going to come by and pick us up,” Megan says, sounding more upbeat. The trail angel’s name is Tom. And, yes, his trail name is Plans Too Much. Right now he’s helping other hikers, so he won’t be here for another hour. “Always had grand plans of getting out of town early but it never works out that way,” Megan says, chuckling. But then, another setback. The trail angell calls Aysh with some bad news. This is actually not great news for Megan. She’s uneasy about hitchhiking with her dog. And she really wants to get back out on the trail today. “It’s just kind of a bummer, because I was hoping to hike the last couple of miles with my new friends,” she says. These are the ups and downs that seem to be a constant in the life of a hiker. And it’s in places like this hostel that hikers can find refuge and get some help. But the Yellow Deli is also a story of its own. It’s run by a community called the 12 Tribes. The 12 Tribes is a Christian movement that sprang up in the 1970s. It has groups scattered around the country and the world. “We started off as a small Christian Bible study group and we’ve grown and grown,” Aysh says. “And when we came here to Rutland — you know, our faith compels us to love people. Aysh says the group started the hiker hostel in Rutland 16 years ago. And Aysh isn’t his trail name; he says it was given to him when he came to the 12 Tribes community. “The name my parents gave me is Ken. Ken Harris,” he says. Hostel manager Aysh was given his name, which is not a trail name, when he came to the 12 Tribes community. 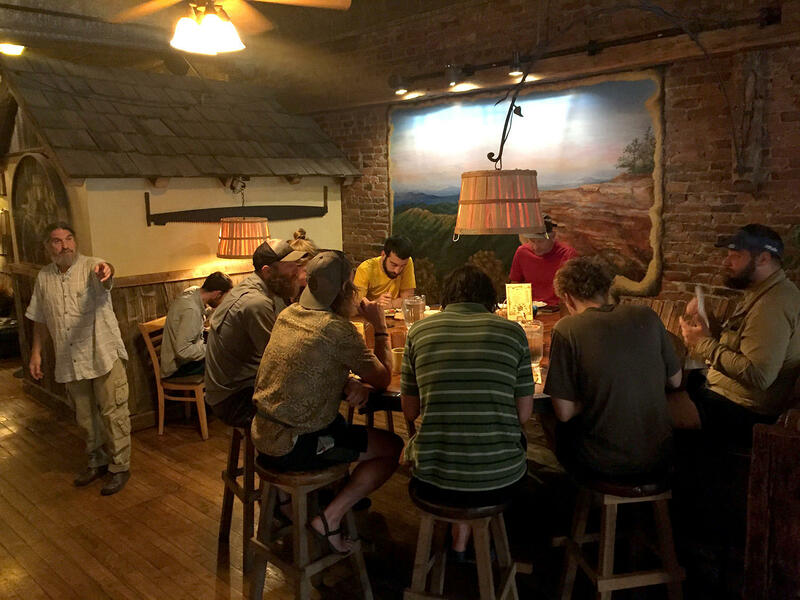 The 40 or so members of the 12 Tribes in Rutland live communally and help run the Yellow Deli. The 40 or so members of the 12 Tribes in Rutland live communally and help run the Yellow Deli. Profits from the restaurant support the hostel, which only asks for donations from hikers. In other words, it’s basically free. The 12 Tribes has its faith, but is it talked about amongst hikers? But this isn’t an expose of 12 Tribes. And for what it’s worth, we later asked Megan – a.k.a. Whoopie Cat – about her stay at the hostel, and she said she didn’t experience any sort of “preachiness” there. Meanwhile, it turns out that Aysh has found a pick up truck he can borrow to give Megan a ride to the trailhead. “Yeah? That's fantastic!” Megan says with relief. “If you just kind of like open yourself up to the universe, you know, things can work out,” she says. But will it work out for Megan? Will she make it back to the trailhead today? And will she finish her Long Trail hike two to three weeks later, as planned? We’ll leave those questions hanging while you read on — just so you can experience the uncertainty of a hiker’s life, day in and day out. While Megan tries to get out of Rutland, Alec a.k.a. Hemlock continues his own journey north. When he parted ways with Brave Little State below Camel’s Hump, we loaned him a recorder to keep taking audio of his trip. Alec is in the realm of Vermont’s highest peaks. Today he’s climbed up and down Camel’s Hump, and then started up a ridge that leads to Mount Mansfield. With about 80 miles left to go on the trail, Alec sounds worn down. As he continues north, Alec’s recordings seem to get more… complex. Day by day, Alec gets closer to Canada. And finally, on August 31, three weeks after he started walking, Alec takes one last video as he sprints toward the end point of the Long Trail, whooping as he runs. The trail opens up into a clearing on the U.S.-Canada border, with a small stone obelisk. “Done!” he says with relish, and surveys the final view. Now that he’s back at Middlebury College, Alec says he’s slowly getting accustomed to spending all day studying instead of all day hiking — and he’s diving back into life as a student activist. But then, her ankle started bothering her. And at around mile 160, near Molly Stark Mountain, Megan decided she had to stop hiking. “I realized that this was something that's going to take several weeks to get better so I had a call the hike,” she told us. But Megan still abides by that philosophy: The trail will provide. Special thanks to Liza Morse, Tim Patterson and the Green Mountain Club.